Leasing Available from $42.98 per month! Looking for HP M606 Parts? Easily manage and expand this ultra-fast, versatile printer- and help reduce environmental impact. Extend your printing reach. Easily share printing resources on a network with Ethernet connectivity. Easily expand this printer as solutions advance and workgroup needs grow, using add-on, updatable features. Help save time and money with lightweight HP EcoFFICIENT paper- engineered for clean, trouble-free printing. 3 Declared yield value in accordance with ISO/IEC 19752 and continuous printing. Actual yields vary considerably based on images printed and other factors. For details see http://www.hp.com/go/learnaboutsupplies. 4 Acoustic values are subject to change. For current information see http://www.hp.com/support. Configuration tested: M604dn, simplex printing, A4 paper at an average of 50 ppm. 5 Measured using ISO/IEC 24734, excludes first set of test documents. For more information, see http://www.hp.com/go/printerclaims. Exact speed varies depending on the system configuration, software application, driver, and document complexity. 6 Measured using ISO/IEC 17629. For more information, see http://www.hp.com/go/printerclaims. Exact speed varies depending on the system configuration, software application, driver, and document complexity. 8 HP recommends that the number of printed pages per month be within the stated range for optimum device performance, based on factors including supplies replacement intervals and device life over an extended warranty period. 9 HP SureSupply alerts you when your print cartridge is running low and helps you purchase online or locally through HP or a participating retailer. Only available with Original HP supplies; Internet access required. To learn more, visit http://www.hp.com/go/SureSupply. 10 Not all Compatible Operating Systems are supported with In-box software. Full solution software available only for Windows 7 and newer. Legacy Windows Operation Systems (XP, Vista, and equivalent servers) get print and Scan drivers only. Windows RT OS for Tablets (32-bit, 64-bit) uses a simplified HP print driver built into the RT OS. UNIX modelscripts are available on http://www.hp.com (Modelscripts are printer drivers for UNIX operating systems). Linux systems use in-OS HPLIP software. Printing speed measured using ISO/IEC 24734 and excludes first set of test documents. For more information, see http://www.hp.com/go/printerclaims. Exact speed varies depending on the system configuration, software application, driver, and document complexity. 3600-sheet input capacity requires purchase of additional accessories. Optional paper-handling accessories must be purchased separately. The optional high-yield Original HP LaserJet cartridge must be purchased separately. Feature is only available on the HP LaserJet Enterprise M606x. Mobile device needs to be connected directly to the WiFi signal of a wireless direct-capable multi-function printer (MFP) or printer prior to printing. Depending on mobile device, an app or driver may also be required. Wireless performance is dependent on physical environment and distance from the access point in the MFP or printer. For details, see http://www.hp.com/go/mobileprinting. 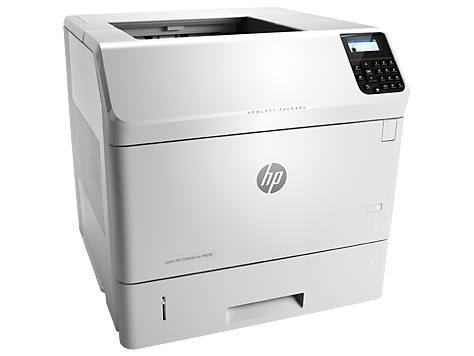 Feature is only available on the HP LaserJet Enterprise M606x. Mobile device must support NFC-enabled printing. For more information, see http://www.hp.com/go/mobileprinting. Based on HP testing using the ENERGY STAR program's Typical Electricity Consumption (TEC) method or as reported in energystar.gov vs. competitive single-function black-and-white laser printers with print speeds between 56 and 70 pages per minute (ppm) as of November 2014. Actual results may vary. Some solutions require download or additional purchase. Learn more at http://www.hp.com/go/printingsolutions. The encrypted hard disk drive (HDD) requires an additional purchase. Online help must be enabled on the printer or MFP. Mobile device must have an Internet connection to access online services. Acoustic values are subject to change. For current information see http://www.hp.com/support. Configuration tested: M604dn, simplex printing, A4 paper at an average of 50 ppm. Not all Compatible Operating Systems are supported with In-box software. Full solution software available only for Windows 7 and newer. Legacy Windows Operation Systems (XP, Vista, and equivalent servers) get print and Scan drivers only. Windows RT OS for Tablets (32-bit, 64-bit) uses a simplified HP print driver built into the RT OS. UNIX modelscripts are available on http://www.hp.com (Modelscripts are printer drivers for UNIX operating systems). Linux systems use in-OS HPLIP software.